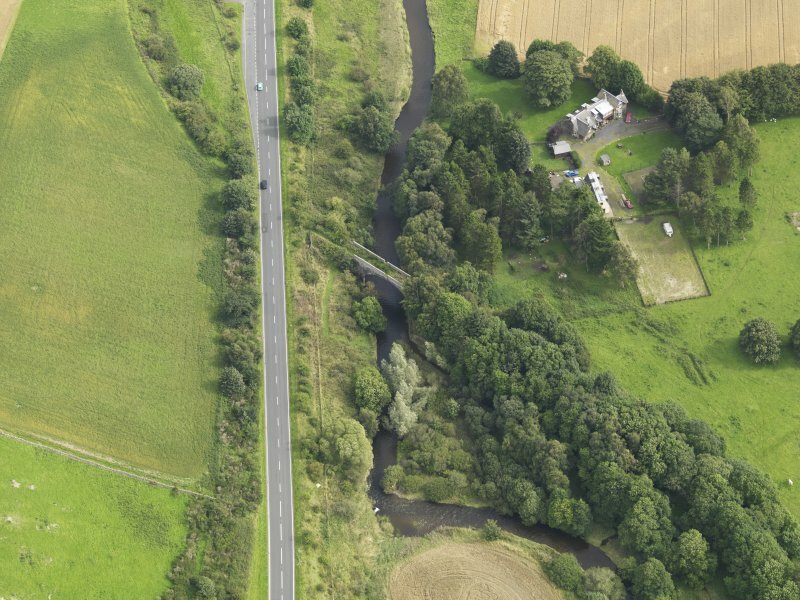 Oblique aerial view centred on the railway bridge, taken from the NW. 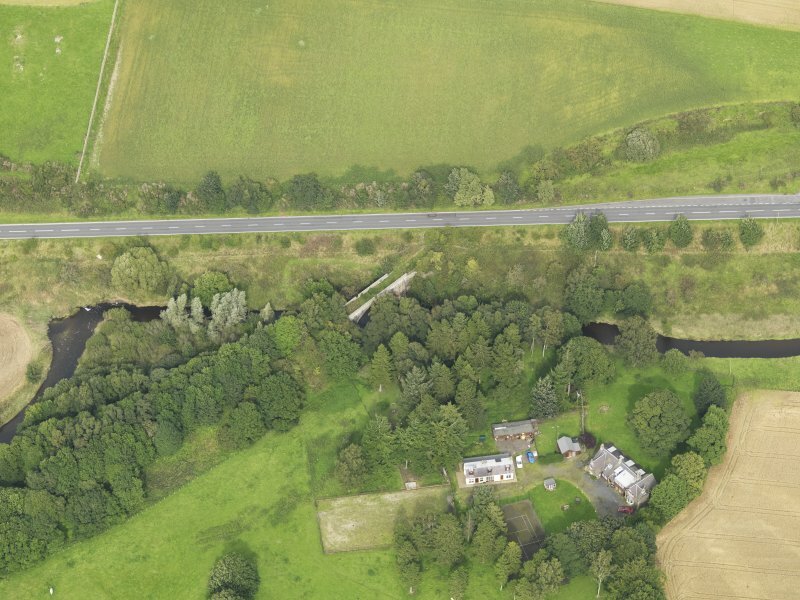 Oblique aerial view centred on the railway bridge, taken from the N.
Oblique aerial view centred on the railway bridge, taken from the SE. 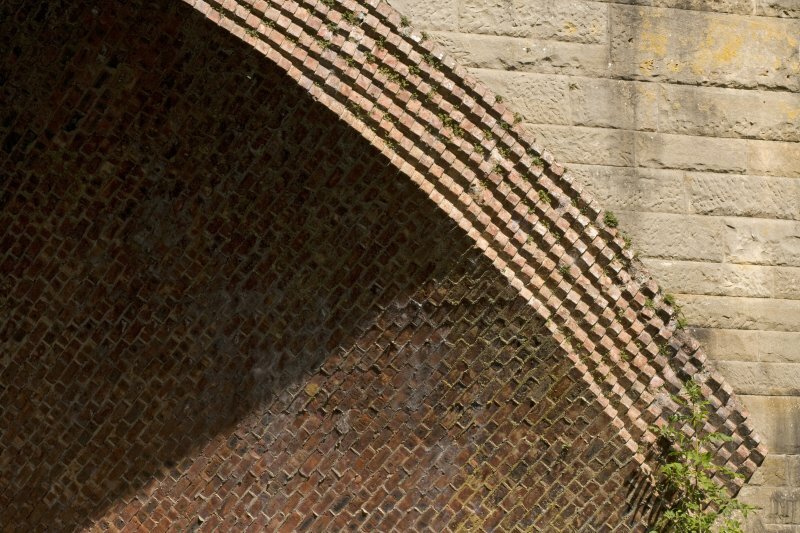 Detail of angled brickwork on skew arch. Detail of refuge (S side). 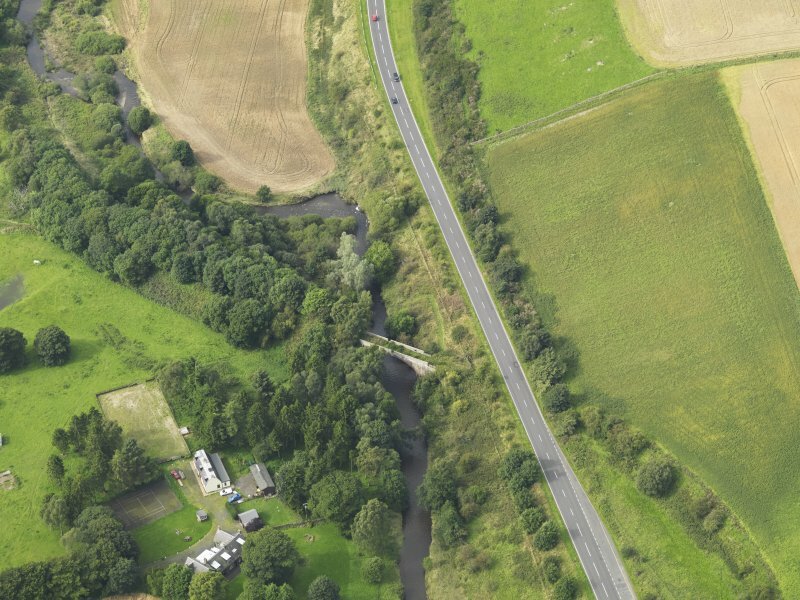 Oblique aerial view centred on the railway bridge, taken from the ENE. Detail of linesmans refuge (S side). 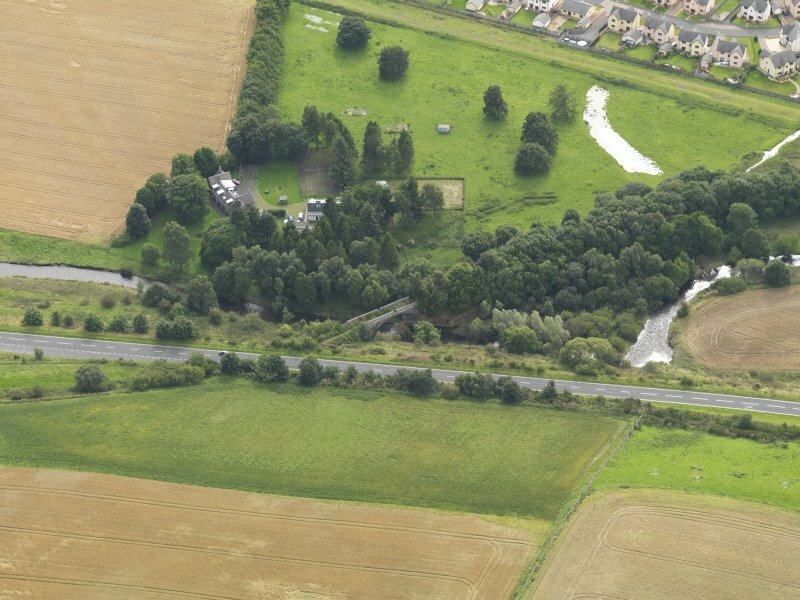 Oblique aerial view centred on the railway bridge, taken from the SW. Detail of refuge (N side). 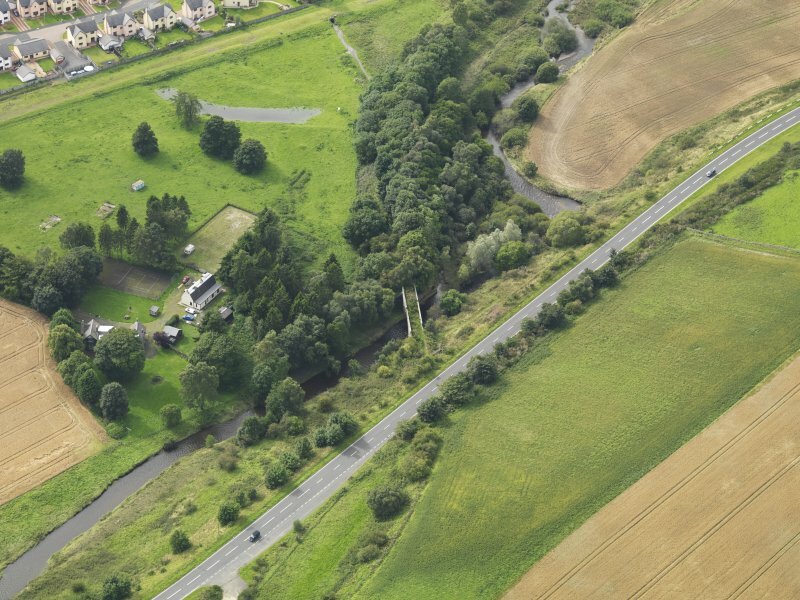 Oblique aerial view centred on the railway bridge, taken from the WNW. 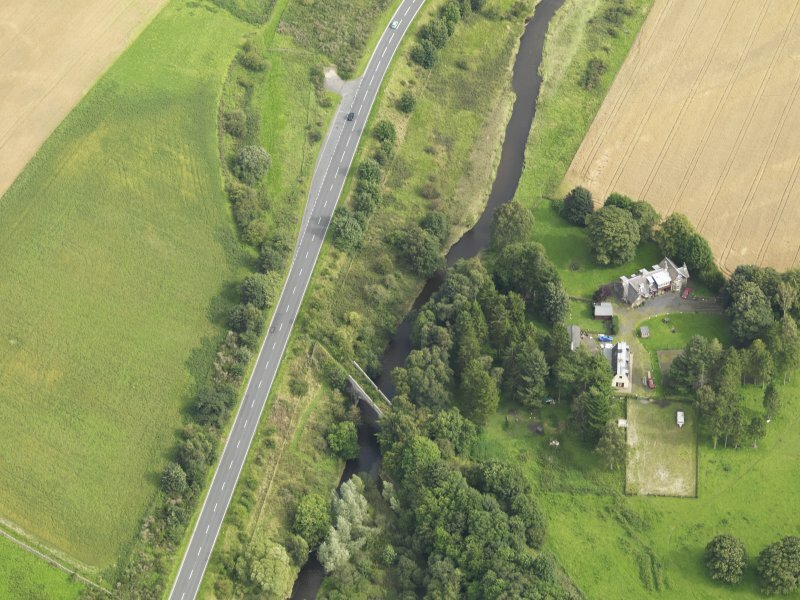 Oblique aerial view centred on the railway bridge, taken from the W.
Detail of linesmans refuge (N side). 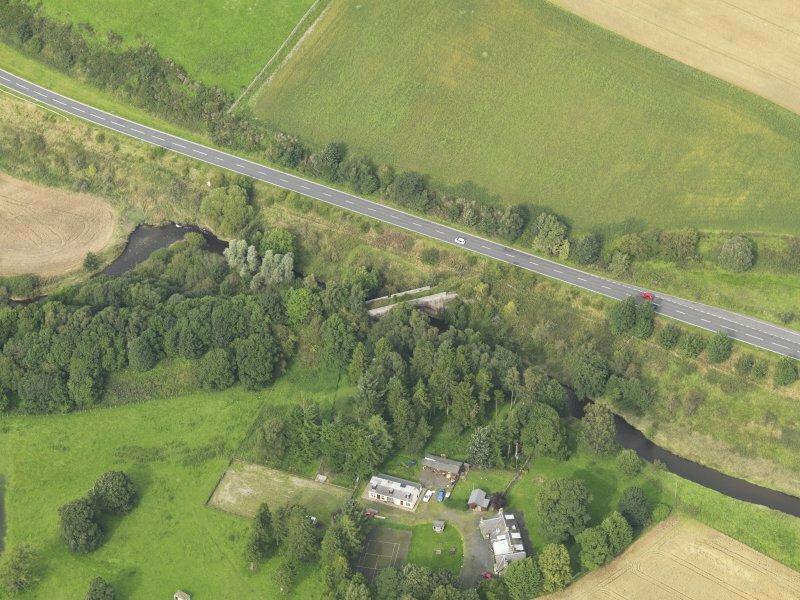 Oblique aerial view centred on the railway bridge, taken from the NE. Not to be confused with NT44NW 74. 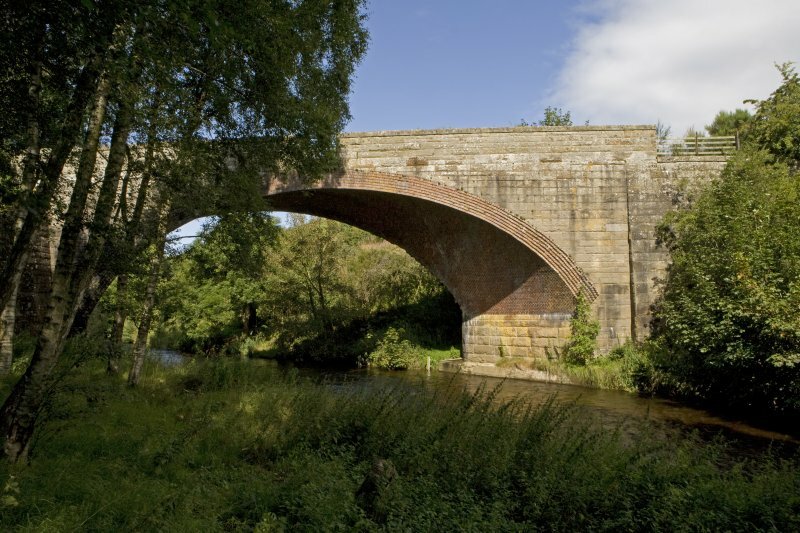 This bridge formerly carried the North British Rly's branch line (the Lauder Light Railway) to Oxton and Lauder (off the Waverley Route) to Oxton and Lauder over the Gala Water. The branch apparently opened on 4 August 1848, but closed to regular passenger traffic on 12 September 1932. Information from RCAHMS (RJCM), 28 November 2005. G Daniels and L Dench 1980. 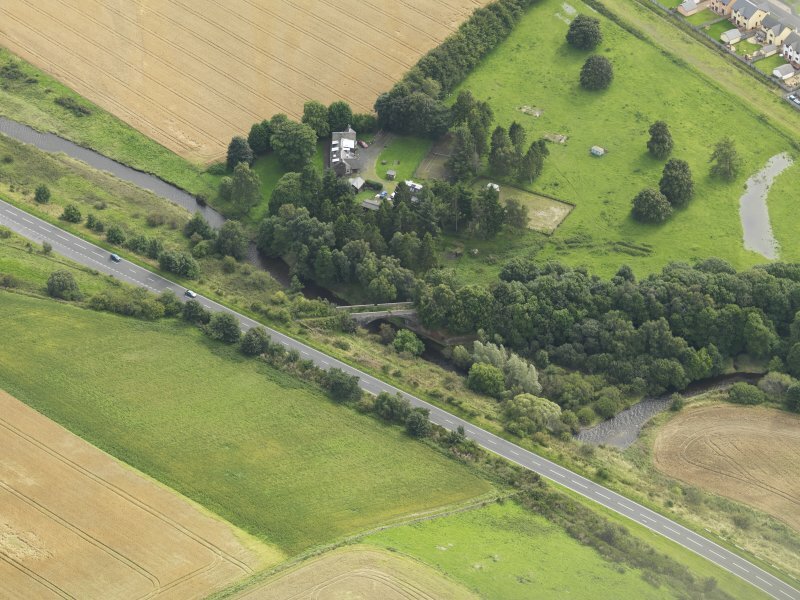 A single arch skew railway bridge is situated adjacent ot the A7 trunk road at Allanshaugh. 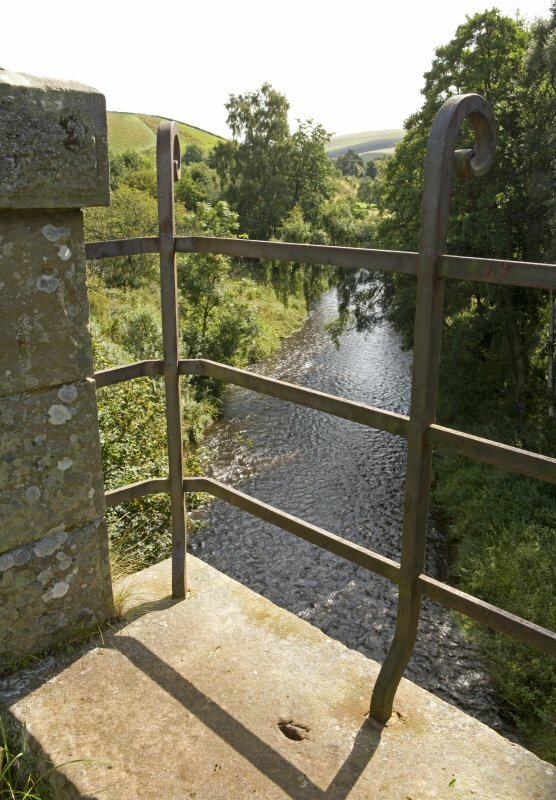 A stone built bridge with brick arch and a parapet in moulded stone with diagonally placed linesmans recesses. 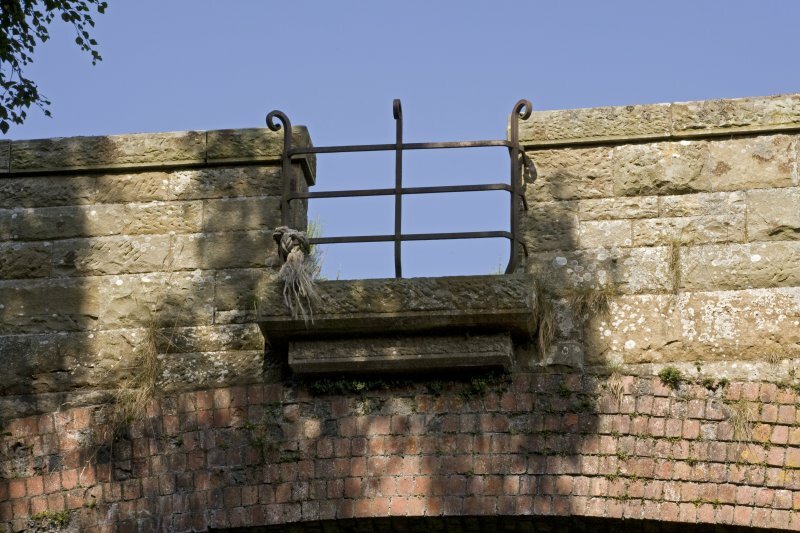 The recesses have wrought iron guard rails which have three uprights and curved tops. On the N side of the bridge, between the bridge and the Still Burn is brick revetting on the bank. 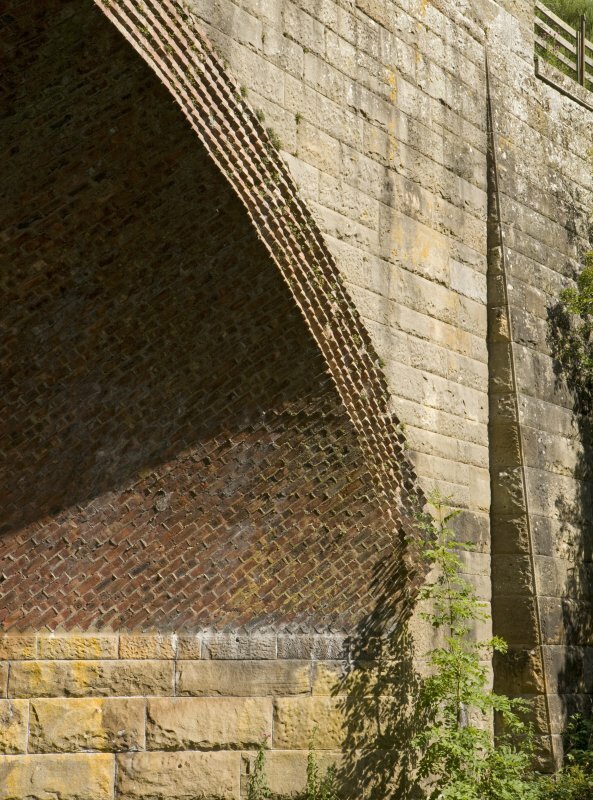 The brickwork on the lower part of the arches has been angled to account for the skew of the bridge. 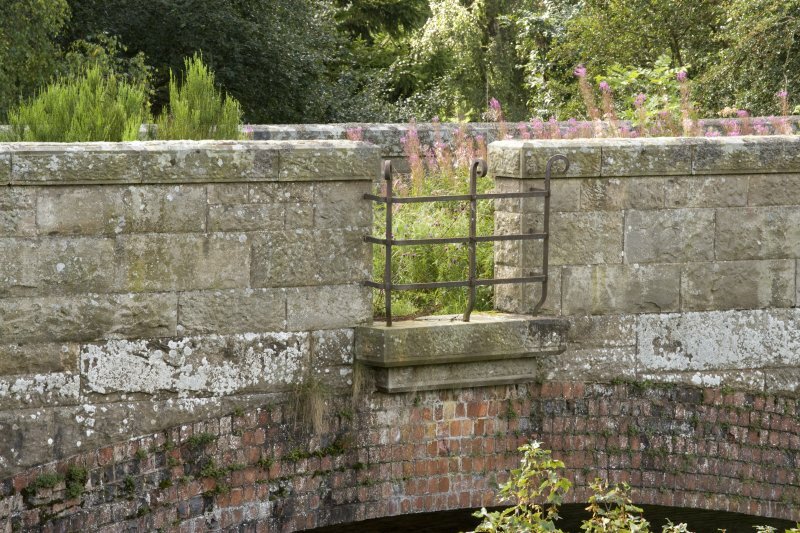 The bridge is heavily overgrown with vegetation on the deck. The bases of the arches have been rebuilt in concrete. 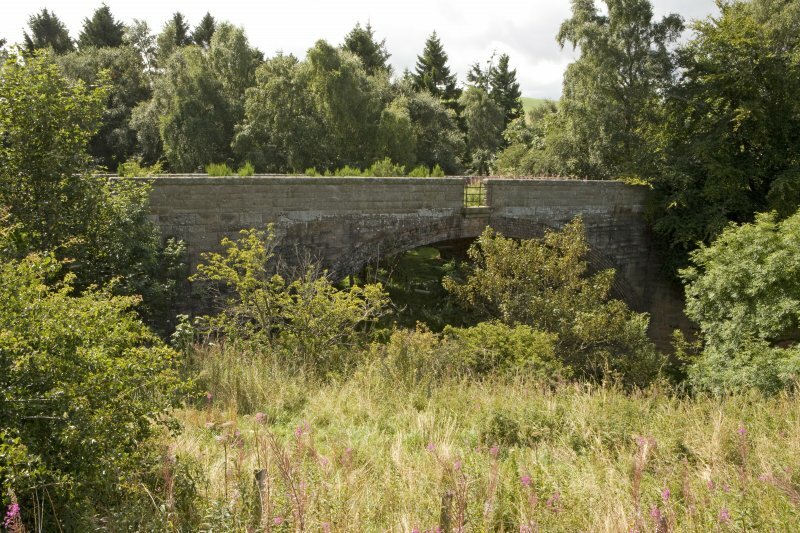 The bridge carried the Lauder branch railway across the Gala Water after traversing the Gala Water valley on a rising gradient via an embankment from Fountainhall railway junction. 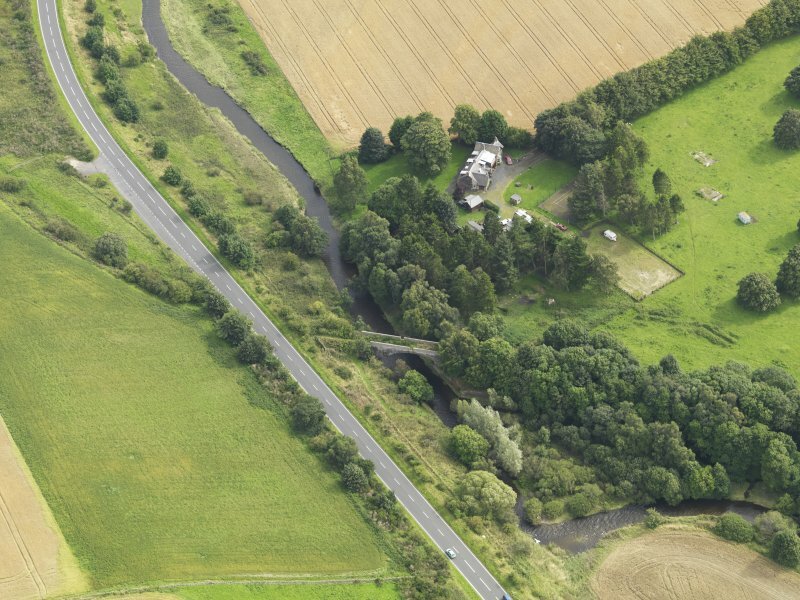 Immediately following the bridge was a level crossing, now removed across the A7. 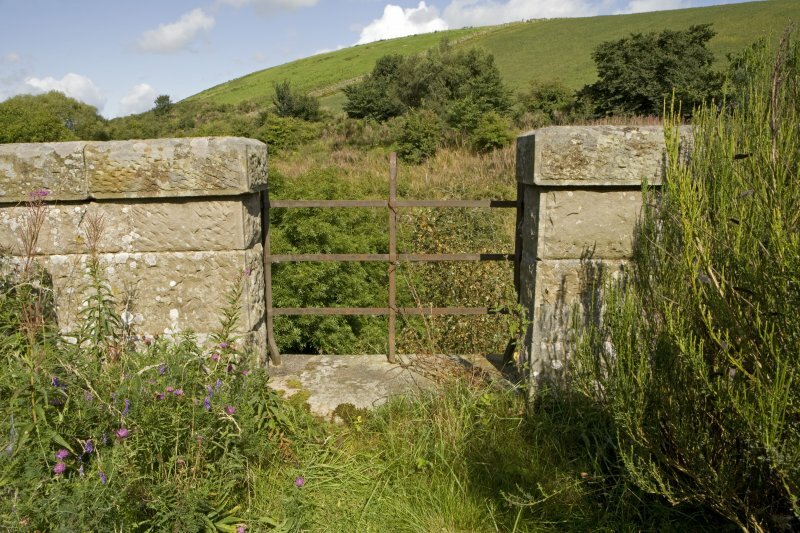 The bridge ceased use in 1958 with the closure of the branch railway to freight traffic.